I've been watching a lot of Twin Peaks recently. I was too young to watch it when it originally aired but have heard a lot about it in recent years and, being that I am of the geek persuasion, was told I should watch it. When it was added to Netflix Canada a little while ago it was at the top of my list. I've spent the last week and a half powering through all thirty episodes. Needless to say, I enjoyed it :). However, what no one warned me about, and what I was not prepared for, was the unending barrage of gratuitous imagery featuring pie and doughnuts. Nearly every other scene in Twin Peaks is filled with huge pieces of pie (typically cherry) and/or stacks and stacks of delicious doughnuts. 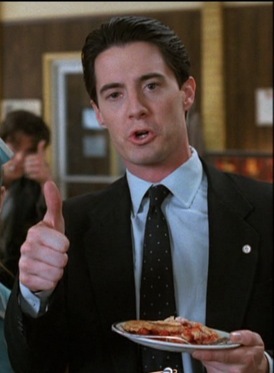 Eventually, Agent Cooper's constant commentary on how good the pie was got to me, and craving set in. The weekend before last, I made a half decent Pecan Pie, but I have made better and decided not to post the recipe as a result. This week though, I wanted to make a fruit pie; something traditional, yet a little different. The idea of honey and apples popped into my head and was to delicious to resist. I started with my current apple pie recipe, using both Granny Smiths and Golden Delicious apples and replacing the sugar with honey. I reduced the amount to compensate for honey being a bit sweeter than sugar and increased the cornstarch because of the extra liquid. I also doubled the amount of nutmeg because I thought the flavour would work well with honey. I used my favourite crumb topping, though it occurred to me afterwards that adding almond meal, instead of flour, would have created an even better flavour combo. The pie baked up perfectly and tasted pretty fantastic. The flavour of the honey was subtle and really only noticeable as an after taste, but it was there. I was actually surprised as to how much it tasted like my standard apple pie. I suppose it's difficult to introduce another flavour in an apple pie since the flavour of baked apples can be quite intense. 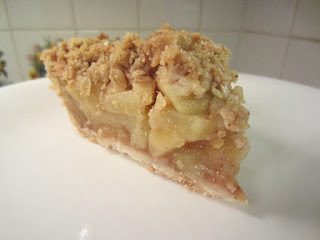 The topping, as usual, was perfect; not too sweet, just crumbly enough and the crust was nice and flakey. Despite some minor worries about the filling being runny, it had just the right consistency. One interesting thing that I noticed was that some of the apples were much softer then they are normally. Maybe because of the honey? 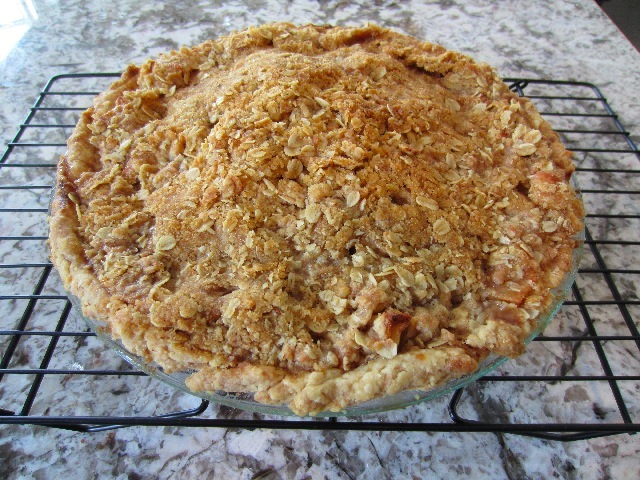 It's hard not to love any form of apple pie, and this one is no different. I was a tad disappointed that I couldn't taste more of the honey, but would be apprehensive about adding more, potentially making the pie too sweet. Maybe increasing the honey but using all Granny Smiths would help balance the extra sweetness. At the end of the day this was a really good apple pie with an interesting little twist. It didn't completely satiate my desire for pie, but that just means more pie. 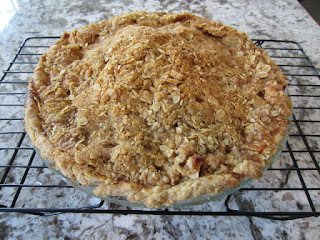 1 9" unbaked pie crust -- My favourite pie crust or your own :). Have your pie crust ready in you pie plate and resting in the fridge. Set rack to bottom 1/3 of your oven and preheat to 375F. In a small bowl add honey, cinnamon, nutmeg and salt and whisk to combine. Core and quarter apples. Slice each quarter in half. Then slice apples width wise into 3/4 inch pieces. Place apples in a large bowl and add honey mixture. Set aside for 20 to 30 minutes. Add cornstarch to apples and mix everything together. 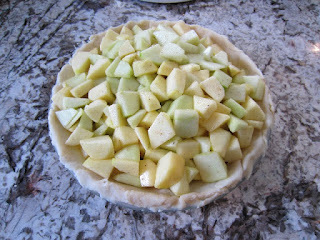 Dump apples into prepared pie crust and pour any remaining juice over the apples. Evenly top apples with crumb topping. Bake for 55 to 60 minutes or until filling begins to bubble (this took me 55 minutes). Set to cool on rack for at least 5 hours before eating. I loved this post! 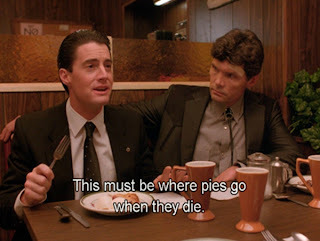 It has been more years than I care to remember since Twin Peaks was on TV. I didn't see all of the episodes (and yes, alas, I do remember when it was on in 'real time') but even non-food people at the time commented upon the omnipresent nature of the pie. Someday, I would love to see a David Lynch documentary on pie! I often have that problem with honey-based desserts as well, unless the honey is directly applied to the top of the dessert or absolutely saturates the pastry (as in baklava). What type of honey did you use? Buckwheat honey sometimes has a slightly stronger taste than clover honey but I don't know if that would make a huge difference. Perhaps marinating them for longer in the honey? You know every time I go to honey for a recipe I always for get that it's very hard to pull the flavour from it. Those honey cookies I baked a little while ago were probably my greatest success in that regard.